Pop Century definitely takes the number one slot amongst the other value choices at Walt Disney World. This resort is fairly newer than the All-Star Resorts, and the décor is based on the decades between the 1950s to the 1990s. The resort has transportation that is not shared with any other hotels. The rooms are practical for every guest’s needs, and include free Wi-Fi. The hotel has three massive pools, an arcade, and a food court that serves breakfast, lunch, and dinner. For a group on a budget, this is the place to be. 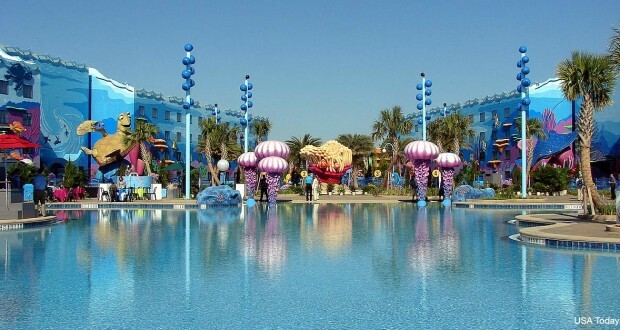 This resort is themed based on the animation of Disney/Pixar movies. Themes include The Finding Nemo, The Little Mermaid, Cars, and The Lion King. The room options include 1120 family suites and 864 standard rooms. Art of Animation has the largest resort pool in the Walt Disney World resort, perfect for a fun day in the sun! This resort has interior corridors, as opposed to the All-Star Resort and has a larger, higher quality food court. This resort is considered a “Value-Plus” and can run up to $5-$10 more per night than the other two value resorts, but the slight upgrades can be worth the extra bucks. The All-Star resorts are always a family favorite when planning a trip to Walt Disney World! There are three resort themes that fall under the All-Star category. There is All-Star Sports, All-Star Music, and All-Star Movies. Each one of these resorts has a similar layout and style, but the themes vary using elements of Disney characters, movies, etc. The hotels are decorated with larger-than-life décor. Giant structures of footballs, Dalmatian puppies, and Maracas can be found that will delight children of all ages. Each separate hotel has its own pool, food court, and bus service to the Disney theme parks. The amenities are basic, but will be a relaxing place to rest after a long day at the park. I am a Political Science undergraduate student. I have been going to Disney since before I can remember and have loved every minute of it! My passion for writing and all things Disney are what makes Disney Fanatic my ideal habitat. It’s the happiest place on earth!